Further details emerge on A Light In The Black Rainbow box set: track listing has surfaced. It answers a lot (but not all) of questions regarding the contents. Disclaimer: the last disk is marked in online listings as CD6 and it is presumed here that it is indeed a DVD like reported earlier. Thanks to Ray and Weltbild.de for the info. Posted by Nick Soveiko on Wednesday, December 3rd, 2014, filed under News. You can follow comment on this post through the RSS 2.0 feed. You can skip to the end and leave a comment. Pinging is currently not allowed. All that and no ‘Light in the Black’? fine… but where is the title track? Any dates, prices etc yet? A Light in the Black isn’t even included on the playlist. It is one of the BEST songs in the whole Rainbow collection. Throw out the crap with JLT, and re-issue. Just my opinion. I guess it was too much to hope for that it was going to be the full Donington show. Bummer! Monsters of Rock DVD – why an incomplete concert? Oddly enough no “A Light In The Black” on this collection. I wish they would put out a 2cd set live from each album tour. That would be something really worth having. Just in time for crimbo. can you hear me wifey?? The full Donington vision is thought to no longer exist. Just the BBC half hour edit. Even the director doesn’t have it, as has been repeatedly stated more times than I can recall. Shame some people don’t like the later stuff. Ritchie was spot on when he said Joe did more for Rainbow than any other singer. Obviously some people can’t appreciate it. LA Connection looks to be from Din Kirschner’s Rock Concert, as it appeared on the Munich 1977 DVD. That means studio backing, with live vocals and canned applause. Interesting that they’d include the LA Connection from Don Kirschner, when it’s only the studio backing track with live vocals and canned applause. JLT may have done more for Rainbow “commercially” but DIO IS RAINBOW and Doogie White is far better than JLT while I really do like some of the JLT era just not as much IMHO. this is what i find amazing but it can’t be helped, it should have this it should have that, i am with you Jerry in relation to Joe Lynn Tuner, who cannot ever forget “Straight Between The Eyes” if that’s not a classic i am not sure what planet i am on. Personally speaking, the Bonnet live material isn’t a lost performance at all! Not to me it isn’t, Never could get into that lineup, or at least Bonnet on vocals, especially when trying to sing the Dio material! Overall though a good compilation indeed me thinks! Cheers. A disappointment and a great opportunity missed…do we really want to listen to ‘rough’ mixes of songs and songs we have heard before and before and before? There are a few interesting live tracks ( some we have heard before! ) 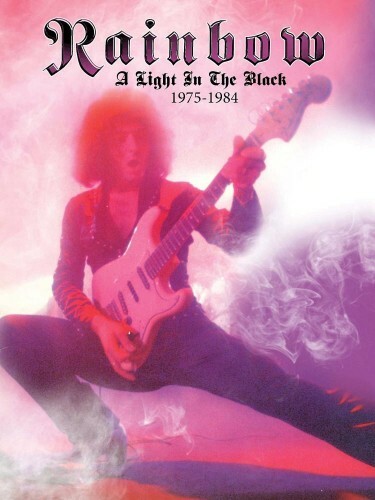 and yeah no ‘A Light in the Black’…a mystery indeed as its Rainbow’s better songs. I guess whoever releases these box sets are not Rainbow fans..a shame. They never play “Stargazer” (? with Graham Bonnet ?) at Donington Park (DVD). But for the rest … interesting stuff. Cardiff 1983 NOT 1984 of course. Seriously how many times do I have to buy this stuff? Just offer the DVD for sale. Anybody know if a U.S. release is imminent? I just pre-ordered through Amazon UK, but would prefer to get U.S. version as it often auto-rips the MP3 to my cloud for free in the U.S. The Roger Glover remixes of the Mark II albums raised my expectations for any Purple related re-release. Disappointing but at least we have another Rainbow release. Wish some of the old members would perform the Rainbow songs again. Thanks JLT for touring Over the Rainbow in 2009. 19. Stargazer was played at Donnington, and was released on an LP compilation of the show back in the day. I could never own a record company, because I would have called this “Rainbow’s Greatest Hits” or “Finyl Plastyc,” names which aren’t as good. ‘Straight Between The Eyes’ is pretty average with just a couple of good tracks and too many fillers. ‘Power’ is one of the worst, such a lazy riff. Ritchie was coasting at this point in his career, only became inspired when Purple reformed with ‘Perfect Strangers’. If only Coverdale had taken up Ritchie’s recent offer to do something, not sure either men will release anything breathtaking again. Shame. Aren’t the rough mixes and 1976 Japanese tour songs all from the 2 CD deluxe editions of Rising, Long Live Rock n Roll and On Stage? Stargazer is from the Donnington 1980 album, so we finally have both songs from that album on CD. Nice to see some of the radio broadcasts featured, but I’d always hoped we’d get those in their entirety someday. Overall a decent package, but somewhat redundant with so many of the special songs already released on other CD’s. And the title track?And the mosters of rock live cd? Indeed, Stargazer and All Night Long appeared on the Monsters of Rock live LP. The mix on them was shocking, as was Bonnet’s performance. La-la-ing his way through Stargazer on account of not knowing the words, and making a dog’s arse of All Night Long. Unless some serious cleaning up of the master tapes and remixing has been done, I wouldn’t look forward to these too much. The box is called “A Light In The Black” but the song itself is not even in the tracklist??? @…27 … 29 … 30 … Sorry my fault … They played truely Stargazer at Donington Park. To the guy who wrote “who’s Jerry?” If it is “Jerry Bloom” then the guy knows what he is talking about. It is surprising how little is out there and how little new is actually offered here. The Bob Daisley stuff is probably good and new to fans. I actually like that version of Stargazer from Donnington,..Ritchie’s solo is great. Blackmore was so inspired at that show. I would be happy if that half hour edit is a bit better quality than what has been floating around. It is a bummer that duplicate material is offered from the “Deluxe Editions.” I wish they would continue that series. JLT told me at a show in Worcester MA 1991 that there are a hole series of great instrumental jams with Ritchie playing to a drum machine. That is the Holy Grail…wish those would come out. I bought a great DVD of the Rainbow Tokyo 1984 show on Amazon awhile back. If I recall, SOTW was cut, but it appeared to be a low generation copy. The sound and video were pretty good, easily the best performance available on DVD by Rainbow. Pretty sure it’s NOT official, but then at the price I paid I didn’t care. 2. Remix the first album! Would be surprised if the masters are ‘lost’. Even if they can’t do a Machine Head-style miracle they surely must be able to get rid of the muddy sound.